What can I say about Humbug except that he took forever to make, is extremely charming and at the moment I am loathe to part with him so he is here as an example only. 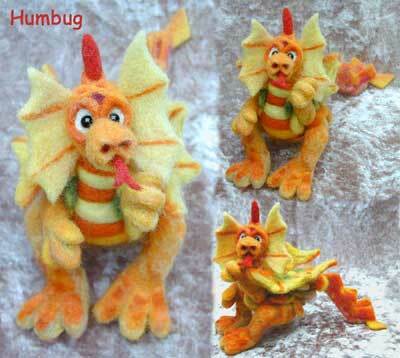 I love all things fantasy especially dragons and so Humbug was inevitable. He was made using all of the wool I had left over from making Tom Tom plus some yellow, orange, red and green I dyed just for him. He measures 22cm from toes to tip of tail and 16cm high. He has contrasting feetie pads, is scaled, banded, lined and marbled so incredibly detailed and totally bonkers.